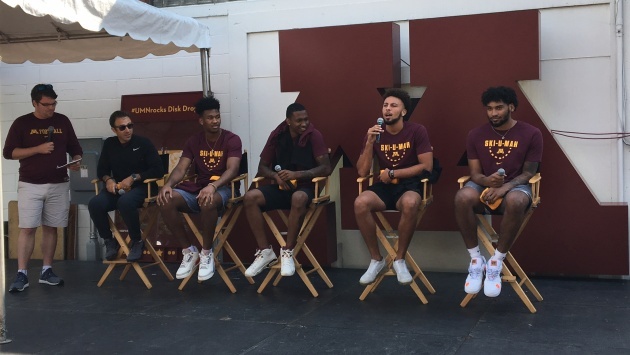 Video (02:42) : Gophers coach Richard Pitino talked about freshmen, newcomers, Jordan Murphy and gave injury updates Wednesday at the Minnesota State Fair. Doesn’t get better than getting to hang with members of the Gophers basketball team on the same day you stuff your face with cheese curds, cookies and all types of meat on a stick at the Minnesota State Fair. That’s basically how I spent my Wednesday this week at the University of Minnesota and Star Tribune fair booths and interview stages. Of course, other than a stomach ache at the end of the day from not knowing when to quit eating, I also had a recorder full of Gophers notes from my fun and interesting chat with Gophers forwards Jordan Murphy and Eric Curry. Richard Pitino also talked about newcomers and gave some injury updates. Redshirt sophomore Eric Curry, who missed last season with a knee injury, is looking good despite having his reps limited at the end of summer practice for precaution. Pitino expects him to be fully cleared in mid-September. Curry and freshman center Daniel Oturu (shoulder) will be ready to play for the Nov. 6 opener against Nebraska-Omaha. Junior Amir Coffey (shoulder) and senior Dupree McBrayer (leg) are already ‘full go’ after being sidelined the end of last season. Wisconsin-Milwaukee graduate transfer Brock Stull arrived in Minnesota on Tuesday and joined the team. "It's just a matter of teaching him the system and getting him in basketball shape now," Pitino said. No word from the NCAA on the waiver sent by the U on behalf of Pittsburgh transfer Marcus Carr to be eligible to play immediately since his coach was fired in the spring. Freshman guard Gabe Kalscheur was one of the biggest surprises of the summer practices. Pitino said Kalscheur had a "terrific summer," and is very serious about the game, which is different for freshmen. He isn’t just a shooter. He has great work ethic, understands the game and should help on the defensive side right away. Also, the former DeLaSalle star is taller and bigger than he’s listed at 6-foot-4 and 180 pounds (more like 6-5 and around 200). Senior center Matz Stockman "never left" the U, because he wasn't able to graduate this summer to transfer to Cal, Pitino said on KFAN 100.3 on Wednesday. How the 7-1 former Louisville transfer fits in the rotation is unclear, but Pitino said he's "very skilled."